A recap from our ENGAGEMENT PICTURES! Isn’t this wedding stuff just so much fun!? 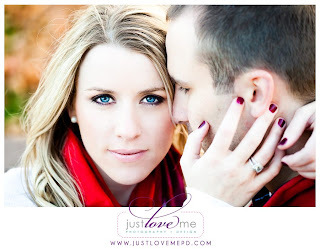 So, last Sunday afternoon, we were scheduled to have our engagement pictures taken by our wonderful photographers, Just Love Me Photography + Design. Ok, so maybe that was just me. I did drag Justin out to Woodfield Mall on Saturday night to pick out a couple new things for the pictures, and he was such a good sport. I decided last week that I should probably go have my hair and make-up done for the pictures. I wasn't going to at first - but then I realized that, hey, this is kind of a big deal, people! So on Sunday morning, we had all of our clothes and everything (down to my earrings and socks!) laid out for the pictures, so we would pretty much be good to go. With that done, the only concern was the gross weather that was taking place outside! It was cloudy, chilly, and RAINY all Sunday morning. So, I scurried off to the salon to get pretty with my fingers crossed things would clear up. I wanted to have loose curls and some sort of make up to bring out my eye color, and Mario Tricoci definitely delivered. I was very impressed with my hair stylist, Gina, and my makeup artist, Elle. I would highly recommend them to anyone who lives in the Northwest Suburbs (the salon is in Arlington Heights). After I was all primped, I came out of the salon to sunshine (yesss! ), and went home to gather everything up to head out to Kline Creek Farm in Carol Stream. I had previously spoken to one of our photographers, Jessi Cabanin, about our “vision” for the pictures. I didn’t give her a whole lot to go off of, just that we wanted something more “country,” than urban. Jessi suggested the farm, and I cannot even tell you how SPOT ON she was with this setting. 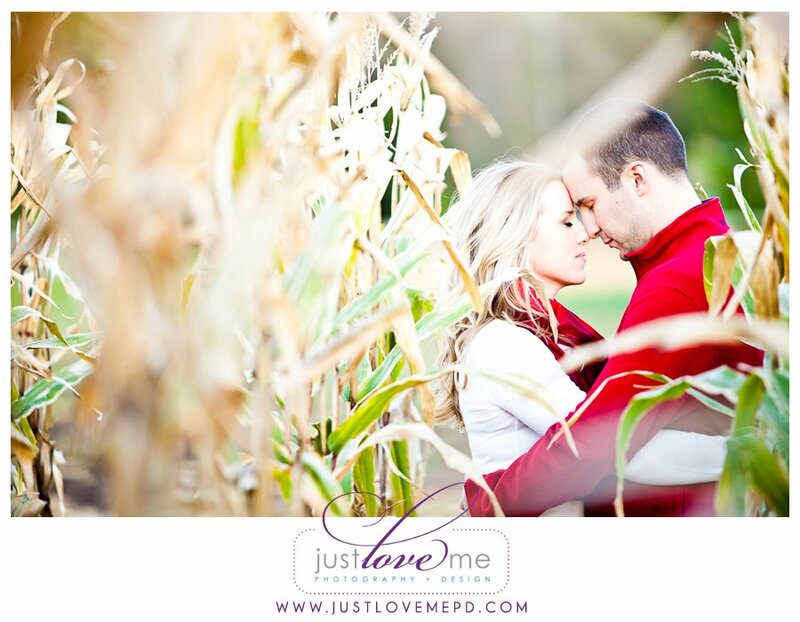 It had everything that we wanted – gorgeous fall colors, cornfields (we’re both from Indiana, and we’re getting married back there – so I thought cornfields would be fun! ), and lots of other fun spots to shoot. We had SO much fun taking our pictures. The session lasted just a little over 2 hours, and I think we got some amazing shots. We did a good mix of serious/fun, modern/traditional pictures. We had one outfit change and took pictures ALL over the farm (even with some GORGEOUS horses!). I got to see just a couple of the pictures after they were taken by looking at our photographers’, (Jessi & Julie) cameras, and I GOT SO EXCITED. After we left the farm, Justin & I decided to go to one of our favorite restaurants, Yardhouse, to watch the Bears game and have dinner. I was literally GLUED to my iPhone the whole dinner (sorry Justin! ), anxiously awaiting the “sneek peaks” Just Love Me posts pretty quickly on Facebook. One, by one, by ONE, they started coming! 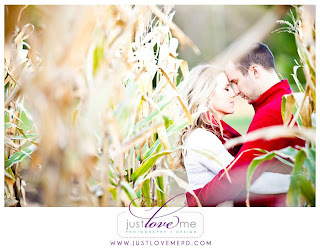 This one captured exactly what I pictured for our photos - LOVE it. We did one outfit with IU colors - and one fall look in our wedding colors. I was giddy when I saw the pictures. I could not stop looking at them! The ones we have seen so far are so much more incredible than I think either of us could have imagined. These ladies really know what they’re doing – they know all about the best lighting, the best angles, how to bring out amazing colors, and how to help you relax as a couple so that your relationship can be captured on camera. I am so very happy and confident with our decision to use Just Love Me Photography & Design as our wedding photographers. I cannot wait to see the rest of our engagement pictures, and I am so excited to have them capture all of the amazing moments on our special day! 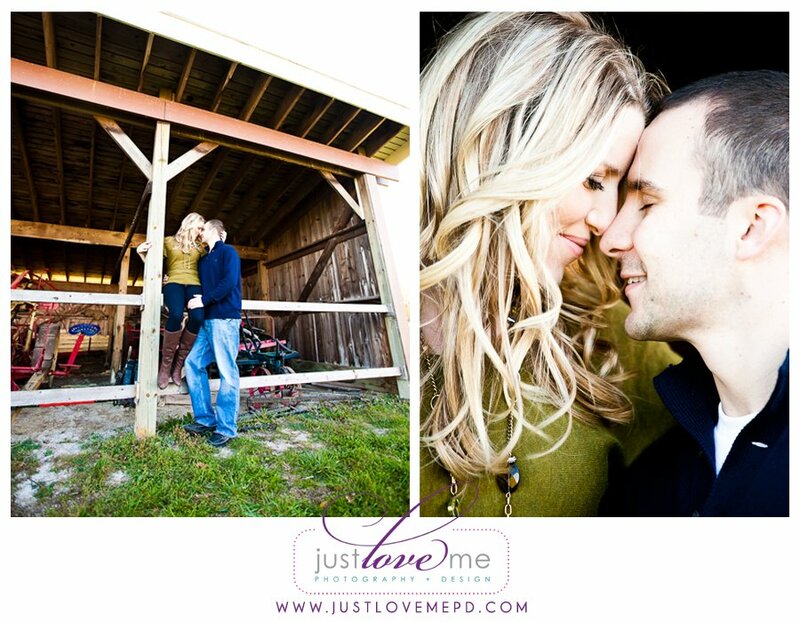 If anyone in the area is looking for a photographer for ANY reason, I highly recommend looking into Just Love Me Photography + Design. She is so beautiful! I don’t have a face like that. So, I am planning to hire a photographer who can manage to make me look good in the photoshoot. I am lucky that I am marrying the love of my life who is also my childhood best friend in our favorite event space NYC. I hope my prewedding photoshoot goes well.